In order to describe the condition of this Rolex Daytona 16520 only three letters are needed - NOS (New Old Sock). This mint Cosmograph from 1997 is accompanied by a full set including original Rolex box, punched papers and other accessories. The stainless steel case is by all means unpolished and has crisp edges. The black dial is absolute flawless. All components from the steel bezel to the crown are in perfect mint condition. The original, green Rolex hologram sticker is attached to the case back and looks absolutely untouched. The original warranty certificate is punched with the serial number and with the country code 170 (Italy). This Daytona was sold in Cremona on February 24, 1998. The full set includes further accessories: Rolex box, chronometer certificate, booklet, leather card holder, Certified Chronometer hangtag and Rolex calendar 1998-99. The movement of this watch is the Rolex caliber 4030. It is based on the movement of the Zenith El Primero, which was modified and installed by Rolex. Therefore, this Daytona is also called "Zenith-Daytona". Also, the Oyster stainless steel bracelet is in mint condition. The bracelet reference number is 78390 and the endlink reference is 503. The clasp code is Z11. 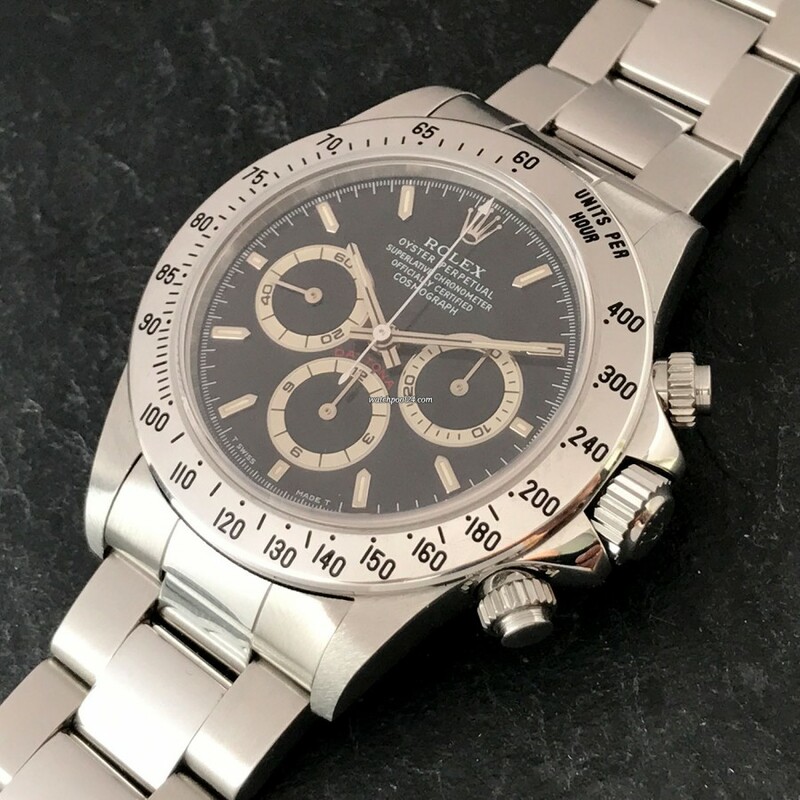 This Rolex Daytona 16520 leaves nothing to be desired and is the non plus ultra for any Rolex collector.